The British Rail Class 158 Express Sprinter is a diesel multiple-unit (or DMU), built specifically for British Rail between 1989 and 1992 by British Rail Engineering Limited (BREL) at its Derby Litchurch Lane Works. They were built to replace many locomotive-hauled passenger trains, and allowed cascading of existing Sprinter units to replace elderly 'heritage' DMUs. The Class 159 DMUs are almost identical to the Class 158s, having been converted from Class 158 to Class 159 in two batches. A total of 182 units were built. The majority were built as two-car sets. 17 units were built as three-car units; eight of these units have since had the centre car transferred to different units of the class, whilst another eight have been upgraded to be Class 159s. The final ten units were built specifically for West Yorkshire PTE Metro services around Leeds. The lightweight aluminium body of the Class 158s leads to a good 'route availability' score, meaning that it is able to operate in parts of Britain where heavier units cannot. However, the units were refused permission by Network Rail to operate on the Conwy Valley and Borderlands lines due to station dwell times and issues of platform clearance. ScotRail was the first part of British Rail to introduce the Class 158s to public service in September 1990. These were employed on Glasgow Queen Street to Edinburgh Waverley services, as well as services to Aberdeen and Inverness. The Class 158s then went on to be deployed elsewhere in Britain, primarily in the Midlands, Northern England, Wales and the South West. After the privatisation of British Rail, the Class 158 fleet was divided among several franchises. The first privatised incarnation of ScotRail inherited a 46-strong fleet which continued in service. Following the introduction of newly built Class 170 Turbostar units on primary express services in 1999, the Class 158 fleet was reduced in number by six, with those remaining cascaded away to secondary routes such as the Far North Line. Unrefurbished Arriva Trains Wales (ATW) 158823 at Barmouth in 2009. Class 158s are required on Cambrian Line services as they are the only TfW trains fitted with the ERTMS signalling used on the line. 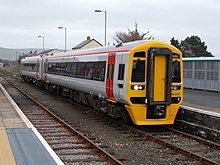 The remaining 24-strong Class 158 Express Sprinter fleet became permanently based at a purpose-built depot in Machynlleth during 2007. Despite initial problems in retro-fitting the necessary 'glass cockpit'-style driver controls, Arriva's Class 158 Express Sprinter units became the first fleet in the UK to be equipped for regular use with the ETCS Level 2 signalling system. Commercial operation under ETCS started on 28 March 2011. WiFi was fitted in 2017, and Persons with Reduced Mobility modifications began in June 2018, with toilet retention tanks also being fitted. On 14 October 2018, these units transferred to Transport for Wales. In February 2019, the first unit was seen in Transport for Wales colours. In May 2015 158889 transferred to EMT from South West Trains on a 2-year loan. This allocation was then made permanent in August 2017 following Stagecoach's loss of the South Western franchise to South Western Railway. The fleet is now used on the long-distance Cardiff Central to Portsmouth Harbour/Brighton, and Weymouth to Worcester Shrub Hill/Great Malvern services. Great Western Railway operates a total of 15 units, of which 12 are hybrids (units where one end coach is a driving coach from another unit of the same class tagged on to a 2 car unit), one is a purpose-built 3 car unit and two are two coach sets. Currently South Western Railway operates Class 158s from Salisbury to Waterloo and on the Salisbury to Romsey via Southampton Central service, between Brockenhurst and Lymington on weekdays, and on a variety of local journeys within Hampshire. South Western Railway also operates Class 159 units, converted from Class 158 units during the Network SouthEast years. One unit is on a daily loan contract to Great Western Railway, whilst South West Trains Class 158s used to be hired out to sister Stagecoach company, East Midlands Trains, and their original pair of 158s were transferred permanently to Abellio ScotRail. South Western Railway operates Class 158s 158880-890. 158885 was fitted with a ZF fuel saving transmission instead of the usual Voith T211rz or T211rzz hydraulic, but this was ultimately unsuccessful and the unit had reverted to the original arrangement by March 2017. Originally brought in to replace South West Trains class 170 fleet, SWR's class 158s saw a brief use on the former Reading to Brighton service, before the service was truncated at both ends within the new South Western franchise of 2007. On 21 July 2013, unit 158774 was parked empty at Norwich when it was run into by 156 402. Eight passengers were injured. The cause was driver error. On 1 April 2017, unit 158758 collided with the buffer stops at Preston at a speed of 6 miles per hour (9.7 km/h). Fifteen people were injured. The cause was driver error. In 1990-91, BREL built six 3-car units based on the Class 158 for State Railway of Thailand. These differ from the British units in being fitted to Thailand's metre gauge, featuring differently styled outer-end gangways, manually operated inward-opening hinged doors (as opposed to the British plug doors), reversible seating and additional air-conditioning. They originally retained the original white, blue and black 'Regional Railways Express' livery. All units of Class 158 of State Railway of Thailand were refurbished in 2011. The refurbishment involved the repainting of the trains into a new livery and the lengthening of the trains to 4 coaches. ^ a b c d e f g h i j k l m "Data Sheets - Regional Passenger Trains: 158 - BREL Express Sprinter". Angel Trains. Retrieved 19 September 2014. ^ a b "First Great Western: Regional Train Fleet". Archived from the original on 20 October 2011. Retrieved 29 April 2010. ^ a b Network Rail (15 February 2010). "ERTMS gets tested in Wales". Retrieved 16 September 2010. ^ a b "Mechanical And Electrical Coupling Index". Rail Safety and Standards Board. Archived from the original on 21 December 2013. Retrieved 20 December 2010. ^ a b c "Our Trains". South West Trains. 2010. Retrieved 18 September 2010. ^ "Class 159" (PDF). Porterbrook. Archived from the original (PDF) on 26 July 2011. ^ "Local Heroes (PTE mainline rail visual identities 1970-1994)". The Beauty of Transport. 2017-03-01. Retrieved 2018-06-08. ^ a b Dalton, Alastair (29 July 2002). "ScotRail launches £2.2m bid to improve unreliable trains". The Scotsman. Edinburgh. Retrieved 28 May 2010. ^ "Misformed Sets - 156 Super-Sprinter - Trans-Pennine Hybrids". Metro-Cammell Class 156 Super-Sprinter. Retrieved 15 June 2008. ^ "Environmental Report 2001" (PDF). National Express Group. Archived from the original (PDF) on 28 November 2010. Retrieved 28 May 2010. ^ "Rejection of proposed Vehicle Change: Class 158 Blaenau Ffestiniog Branch" (PDF). Network Rail. 22 December 2005. Retrieved 25 February 2009. ^ "Rejection of proposed Vehicle Change: Class 158 Wrexham Central to Bidston" (PDF). Network Rail. 22 December 2005. Retrieved 25 February 2009. ^ "156 - Time Line". members.madasafish.com. Retrieved 2018-06-08. ^ "Executive blocks ScotRail plan to trade away most unreliable trains". Retrieved 2018-06-08. ^ Limited, Alamy. "Stock Photo - ScotRail Logo on British Rail Class 158 Express Sprinter diesel multiple unit. Kyle of Lochalsh station, Ross and Cromarty, Scotland, United Kingdom". Alamy. Retrieved 2018-06-08. ^ "ScotRail launches £2.2m bid to improve unreliable trains". Retrieved 2018-06-08. ^ "Special rail carriages plan to ease bike crowding on Scottish trains". Retrieved 2018-06-08. ^ "2nd Generation Multiple Units". www.meaker.me.uk. Retrieved 28 June 2010. ^ Picture of the Day 11 March 2008, therailwaycentre.com. ^ Class 158 Relivery Details, scot-rail.co.uk (Enthusiast website). ^ "Scotland's Railway" Archived 6 April 2012 at the Wayback Machine, Transport Scotland. ^ "Railcare Springburn Class 158 Scotrail Internal refurbishment". Concept Applications. Retrieved 28 June 2010. ^ "Renovation: Class 158 Express (DMU)" (PDF). RailCare. Archived from the original (PDF) on 15 July 2011. Retrieved 28 June 2010. ^ "Delivery against our priorities: Improved connections". Transport Scotland. 17 December 2009. ^ Wales and Borders trains in 2002, railfaneurope.net picture gallery. ^ Newsletter No. 20, Shrewsbury to Aberystwyth Rail Passengers' Association, 2001. ^ a b Fleet lists: Class 158 Archived 5 February 2012 at the Wayback Machine, thejunction.org.uk. ^ "Pioneering past powers Arriva's future". RailNews. Stevenage. 17 September 2007. ^ "Sun glare delays new train system". BBC News Online. 17 May 2010. Retrieved 18 September 2010. ^ Hulme, Charlie (24 May 2010). "North Wales Coast Railway Notice Board 24 May 2010". Retrieved 17 September 2010. ^ "Search: arriva 158 holyhead". ^ "Proposal for new direct Aberystwyth to London service submitted to the Office of Rail Regulation" (Press release). Arriva Trains Wales. 4 September 2009. ^ "Aberystwyth to London direct rail route rejected". BBC News Online. London. 1 March 2010. ^ "Refurbishment of Arriva Trains Wales fleet announced" (Press release). Welsh Assembly Government. 2 August 2010. Archived from the original on 30 March 2012. ^ Crump, Eryl (2 August 2010). "Taxpayers to pay for £7.5m trains upgrade". Daily Post. Liverpool. ^ "£7.5m upgrade for Arriva Trains Wales". Transport Business International. 2010. Archived from the original on 24 July 2011. ^ "Great Western regional refurbishment underway". Railway Gazette International. London. 12 December 2007. ^ "The Pennine Class 185 experience" (PDF). pp. 4–5. ^ "158 STAY CONNECTED (CONCEPT) – Rail Order". ^ "Inquiry into rail crossing deaths". BBC News Online. 4 December 2005. Retrieved 21 June 2017. ^ "Investigation into station pedestrian crossings (including pedestrian gates at highway level crossings); with reference to the fatal accident at Elsenham station on 3 December 2005" (PDF). Rail Accident Investigation Branch. Retrieved 21 June 2017. ^ "Derailment at Dingwall, Scotland 22 January 2010" (PDF). Rail Accident Investigation Branch. Retrieved 21 June 2017. ^ "Passenger train collision at Norwich 21 July 2013" (PDF). Rail Accident Investigation Branch. Retrieved 21 June 2017. ^ a b Grantham, Andrew. "Export Class 158 in Thailand".